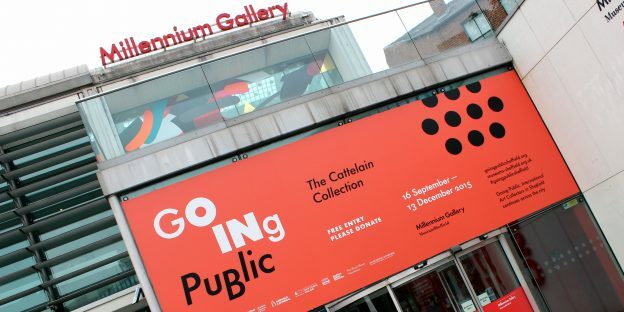 Signage designed by Dust installed outside the Millennium Gallery. The exhibitions took place at the Graves Gallery, Millennium Gallery, Sheffield Cathedral, Sheffield Institute of Arts Gallery at Sheffield Hallam University and at the Site Gallery. Visitors were able to see works by artists including Marcel Duchamp, Jake and Dinos Chapman, Sol LeWitt, Dan Flavin and leading contemporary Cantonese practitioners. A high profile summit took place to stimulate debate, exploring the relationship between the public and private sectors in the visual arts today. I worked closely with the team based at Museums Sheffield and all the partners, establishing shared systems for managing information, files and project management. I liaised with designers Dust, who created a strong visual identity for the project, to help ensure smooth communication. I coordinated the creation, installation and delivery of a host of materials from signage and advertising, to invitations and the exhibition guide.